Mexican Stuffed Peppers - Home. Made. Interest. 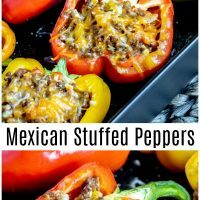 Mexican Stuffed Peppers is a low carb (keto) dinner recipe of seasoned beef, cauliflower rice, and cheese, baked in bright bell peppers. By now you know I love Tex-Mex flavors so I’m always looking for new ways to work them into my low carb diet. 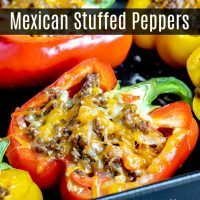 Low Carb Tacos are one of my favorites, but these Mexican Stuffed Peppers are a close second for two reasons. One, they are delicious! 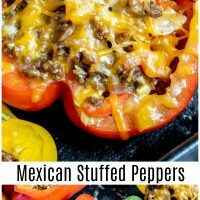 Red, orange, and yellow bell peppers stuffed full of seasoned taco meat, cauliflower rice, diced tomatoes, and lots of cheese. What’s not to love? Two, you can easily make them ahead of time which makes life so much easier during the week. I know some stuffed peppers recipes have you cook the meat inside of the peppers but I prefer to cook my ground beef before stuffing the peppers so they only have to bake in the oven long enough to soften the bell pepper and melt the cheese. The ground beef in this recipe is cooked with onions, diced tomatoes and green chilies, and diced up bell peppers. I add a generous helping of my homemade taco seasoning to spice it up and it’s delicious. 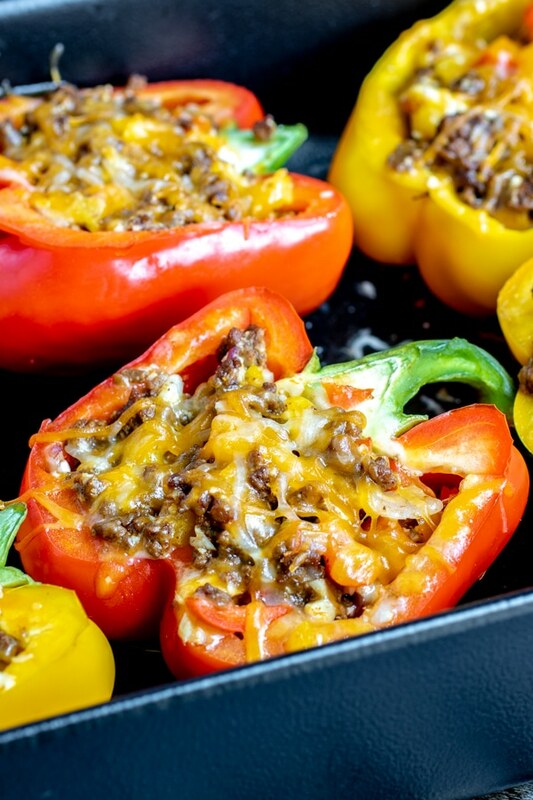 Stuffed peppers usually call for rice to be added to the meat so to keep my Mexican Stuffed Peppers low carb I add cauliflower rice to the meat along with cheese and then spoon the ground beef mixture into the bell peppers. The cauliflower rice doesn’t need to be cooked with the meat because it will soft up as it bakes inside of the peppers. Add a little more cheese on top, cover the casserole dish with foil, and place in a 375 degrees F oven for 20-30 minutes. You want the bell peppers to soften enough to eat. I like mine with a little crunch to them so I cook them for about 20 minutes but if you like yours softer aim for 30 minutes. 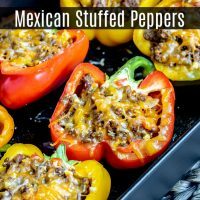 Can I Make Mexican Stuffed Peppers Ahead of Time? Yes! 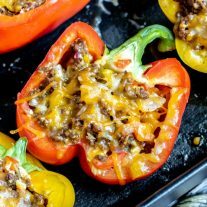 You can cook these fully following the recipe and then reheat them when you’re ready to eat OR you can cook the ground beef mixture and store it in an airtight container in the refrigerator until you are ready to stuff the bell peppers, top with cheese, and bake. 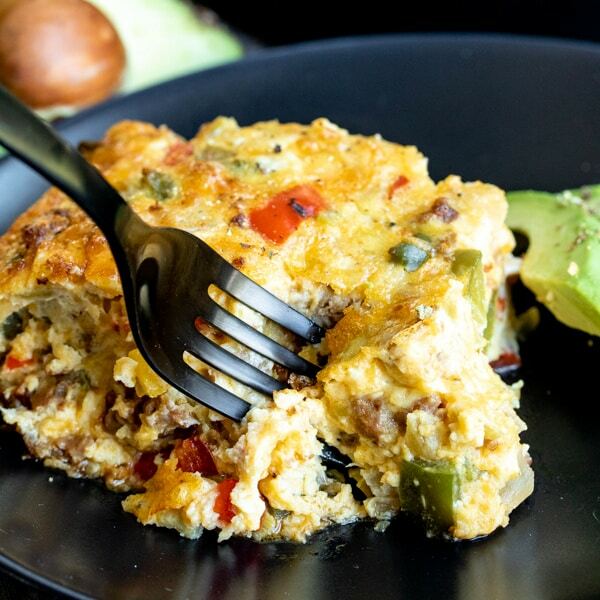 Want more easy low carb dinner recipes? Like this recipe? Pin it to your Easy Dinners board! In a large skillet over medium high heat add olive oil, onion, and bell peppers. Cook for 5 minutes until tender. Set aside. Place ground beef in the skillet and cook for approximately 7-10 minutes until fully cooked. Drain grease and add ¼ cup of water and homemade taco seasoning. Stir so that meat is fully coated and continue to cook until the liquid has absorbed into the ground beef. Set the meat aside. In a large bowl combine cooked meat and vegetables, as well as diced tomatoes and chilies, 1 cup of shredded cheese, and cauliflower rice. Stir until thoroughly mixed. Cut 4 bell peppers in half lengthwise and remove seed and ribs. Please the peppers in a casserole dish and fill with enough water to cover the botter. 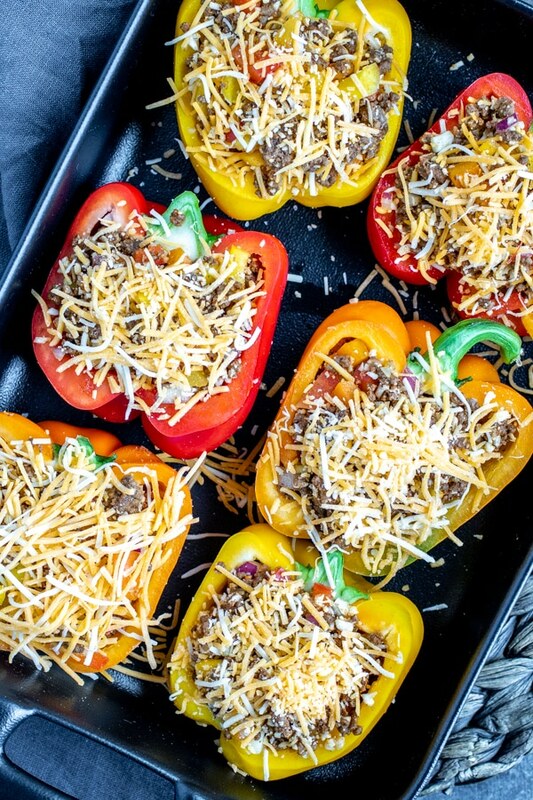 Stuff the peppers with meat mixture and top with remaining cheese. 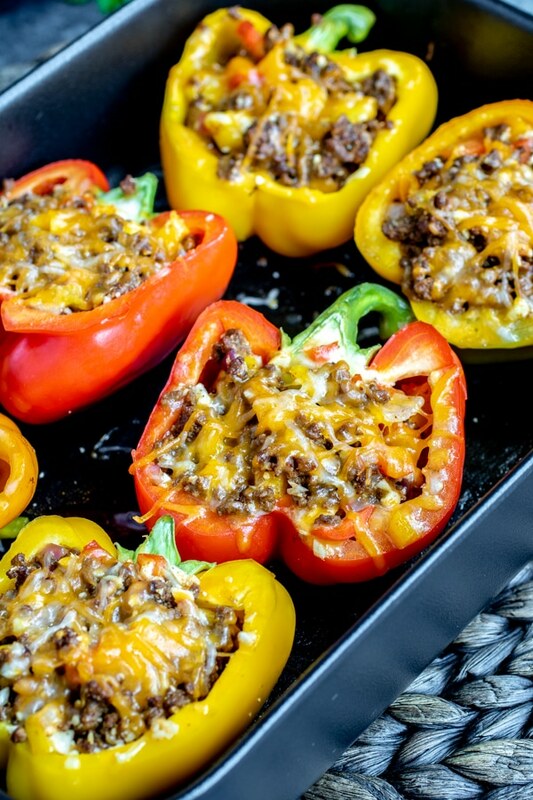 Cover casserole dish and place in oven to bake for 20-30 minutes, or until bell peppers are tender.